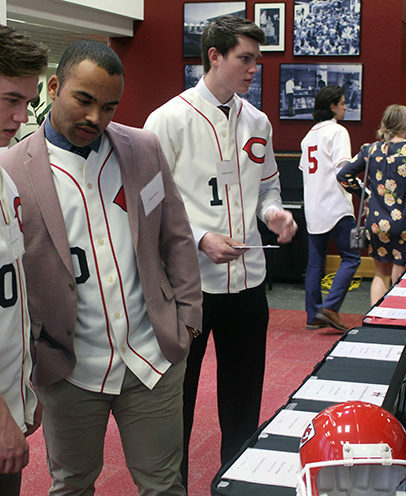 Mules players Donovan Ditto, Micah Evans and Mason Janvrin look over items available at the silent auction preceding the 2019 First Pitch Banquet. Over 400 people attended the banquet this year. 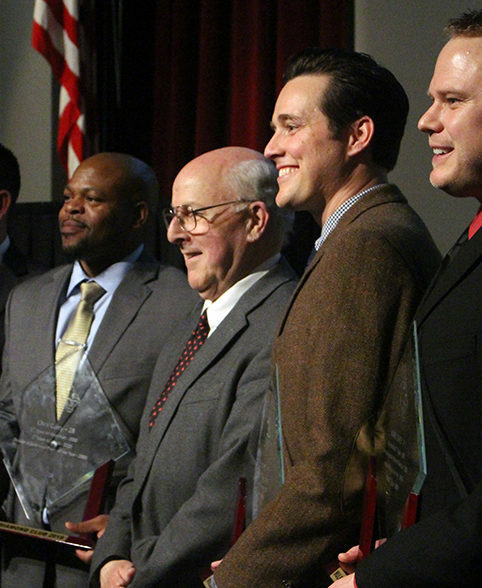 The 2019 Mules Baseball Diamond Club induction class (left to right: Nathan Lipowicz, Seth Collins, Bill Turnage, Steve Sharpe, and Mark Carey) poses for photographs after the ceremony. 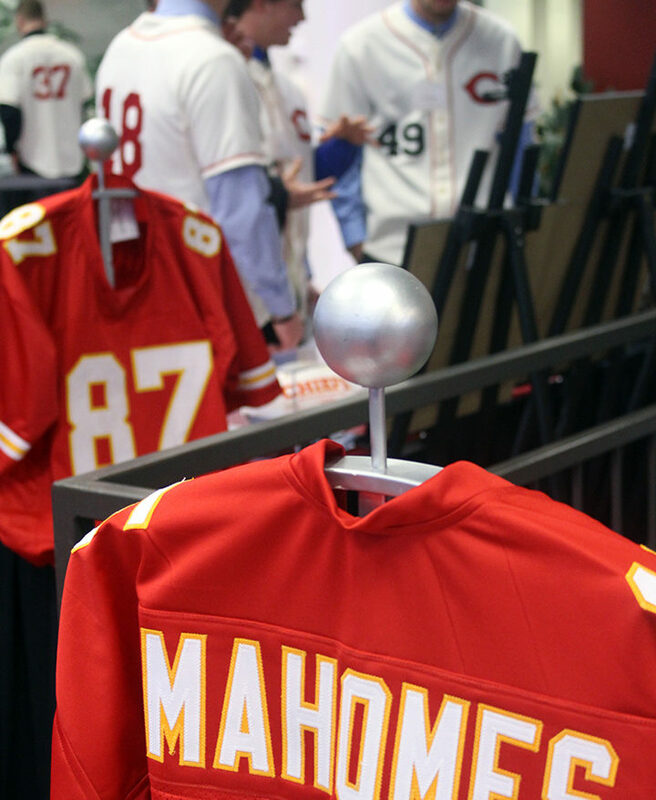 A signed Patrick Mahomes jersey was one of many sports-related pieces in the silent auction, which included items from the Kansas City Chiefs, Kansas City Royals, St. Louis Cardinals and Houston Astros. Former Mules outfielder Seth Collins is inducted into the Mules Baseball Diamond Club as his family looks on. 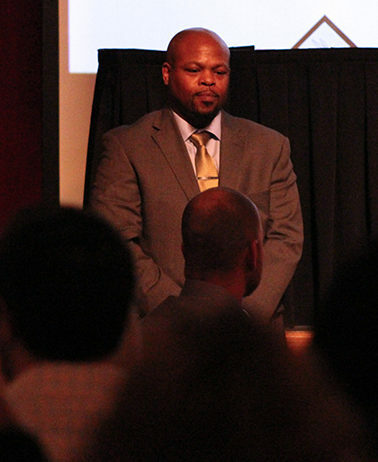 Collins was a two-time All-American with a career batting average of .387, 213 hits and 26 home runs. Former Mules outfielder Nathan Lipowicz stands as "Voice of the Mules" Bob Jackson inducts him into the Mules Baseball Diamond Club. 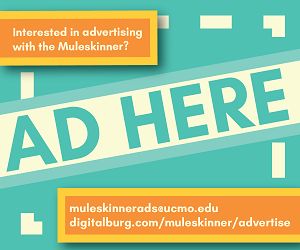 Lipowicz remains the Mules' all-time career home run leader, with 44. Bill Turnage receives a standing ovation as he's inducted into the Mules Baseball Diamond Club. 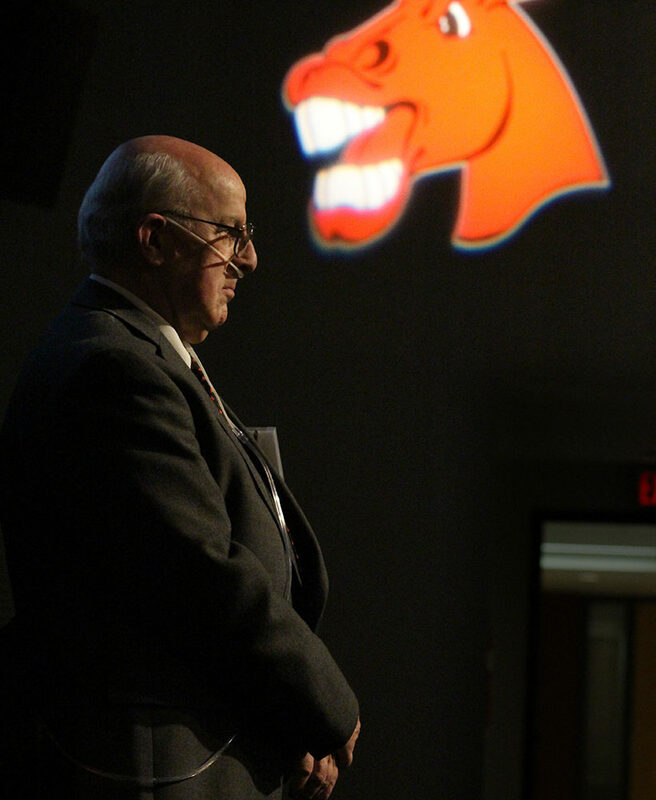 Turnage was Mules Sports Information Director from 1981 to 2002, and was the radio voice of Mules athletics from 1969 to 1981. 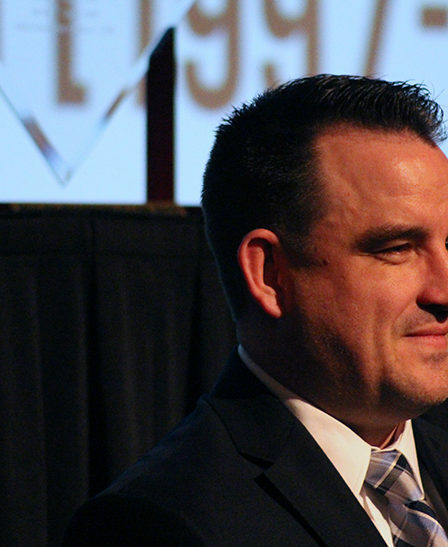 After retirement, Turnage continued work with the Mules, appearing as color commentary on the radio and serving as emcee for UCM Hall of Fame and First Pitch ceremonies. 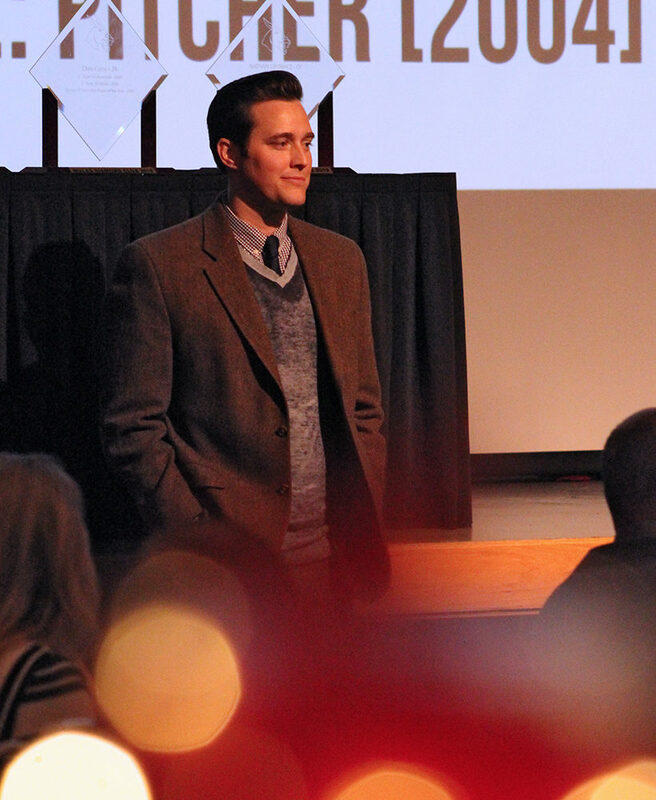 Former Mules pitcher Steve Sharpe stands before the 2019 First Pitch Banquet crowd as he is welcomed into the Mules Baseball Diamond Club. 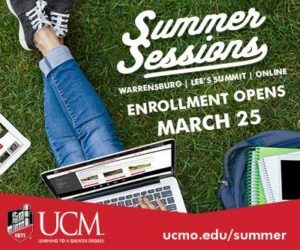 Sharpe only pitched one year for UCM, 2004, but in that year he went 13-0 with a 2.89 ERA and 103 strikeouts across 96.2 innings. 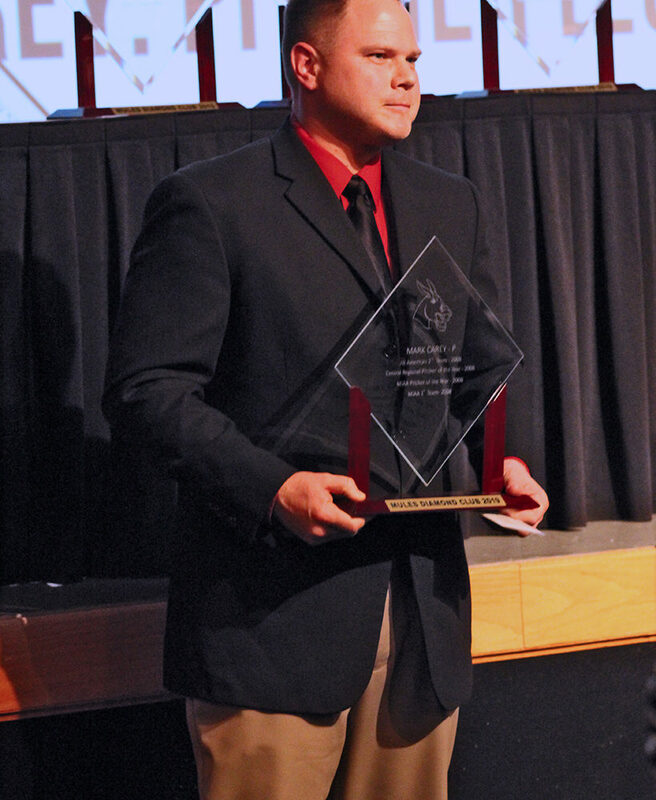 Former Mules pitcher Mark Carey holds his Mules Baseball Diamond Club induction plaque. Carey pitched for the Mules from 2005-2009, striking out 149 batters during that period, and in 2008 was an MIAA Pitcher of the Year. 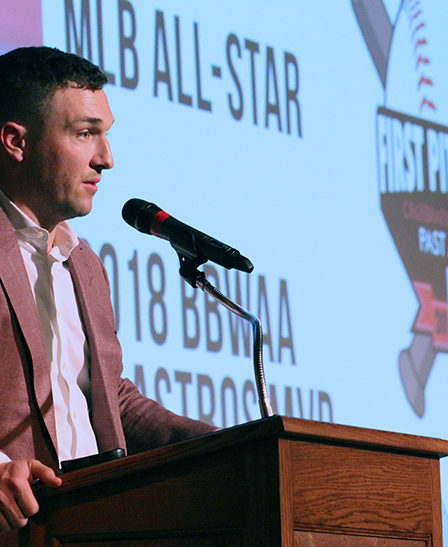 Houston Astros player Alex Bregman speaks at the 2019 First Pitch Banquet. Bregman discussed the influence his college coaches had for him, both as a player, and now in starting his charity foundation, AB For AUDS, which donates iPads as adaptive technologies for children with autism and Down's syndrome. 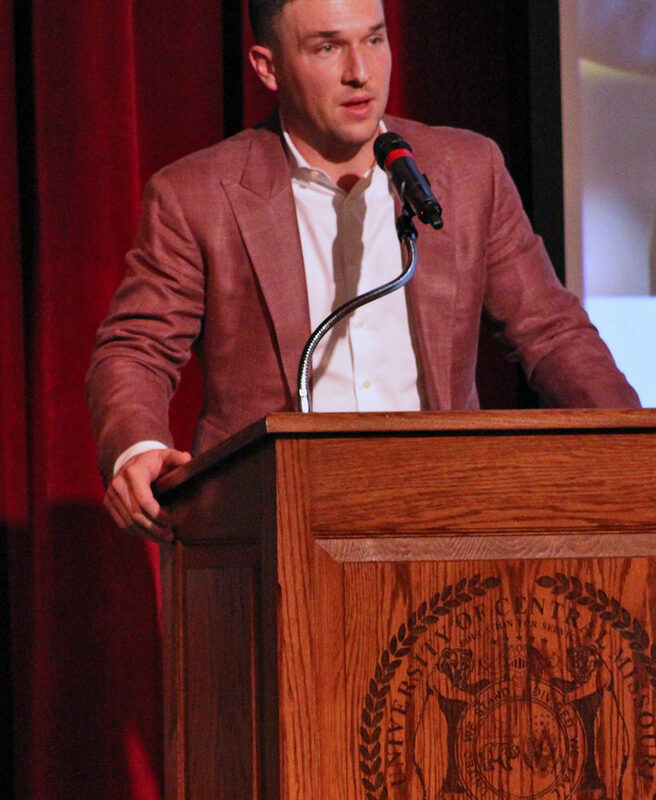 Houston Astros player Alex Bregman gives the keynote speech at the 2019 First Pitch Banquet. 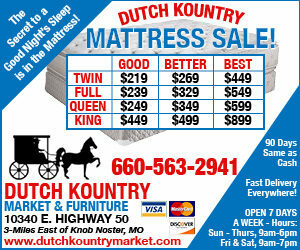 He cited the guiding words of his father, "Hustle, attitude and effort," as the key to his success. 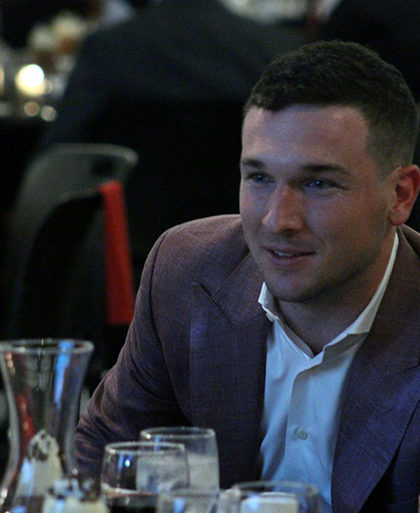 Houston Astros player Alex Bregman talks with attendees of the 2019 First Pitch Banquet. He flew directly to Warrensburg from Houston, after appearing all day at the Houston Astros FanFest.